NEW for 2018 – Enjoy our famous Fireworks Cruise out of Mackinaw City every FRIDAY night from July 13th to August 31st, 2018. Departing from Mackinaw City Dock #1, 801 S Huron Ave. Mackinaw City, MI 49701. The cruise leaves at 9:30 PM in July and 9:00 PM in August. Cash Bar Available serving beer, wine, coke, water and snacks. 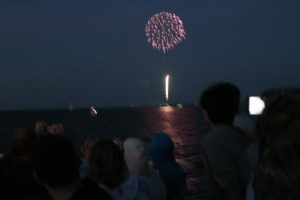 Enjoy our Fireworks Cruise out of St Ignace Dock #2, 99 N State St. St Ignace, MI 49781 every Saturday night July 7th – September 2nd departing at 9:30 pm in July and 9:00 pm in August and September. Cash Bar Available serving beer, wine, coke, water and snacks.